The Indian Agni-V intermediate range ballistic missile is ready is ready for its first test, Defence Minister AK Antony said in Hyerabad on Friday. The actual test, however, is likely to be conducted only sometime in January-March next year. DRDO sources confirmed once again that Spring 2011 was the likely time that the 5,000-km range weapon would first be tested. Notwithstanding the Minister’s comments, DRDO sources indicated that the first Agni-V was about 90 per cent complete, with minor work on the missile’s third stage and heatshield assemblies remaining. The team is also working overtime to ensure there are no quality control issues that have dogged two previous tests under the Agni programe. By November, the first missile should be complete in all respects for its first flight test, though a comprehensive routine of subsystem tests will continue till the end of the year. With the February test, the Agni-III completed its routine of tests and is now ready for induction into India’s nuclear force structure. well done DRDO. you made India proud again. Shiv, does it come with MIRV? chinese must feeling the heat of Agni-V already. Good news, I hope you read this comment session. Could you please update your previous article "Coming Soon: MMRCA BUZZ — Why The IAF Is Nervous About The Americans", its been long. MMRCA generates more interest than any, so, will wait to hear this story. Great job DRDO, great job Mr. Aroor. Bravo! Jai Ho! Jai Hind! Mr. Aroor would you please give us a update on GSLV III. Thanks. Is this news item in response of Chinese denial of Visa ? Use of heatshield assemblies indiacates that it will come with MIRV. 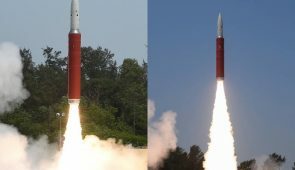 anon@8.38am: The Agni-V has indeed been developed to be a MIRV platform, but my information suggests actual integration and tests with MIRV will take place as a stage closer to 2013. It is possible that the MIRV'd Agni-V will be tested after the Agni-V completes its un-MIRV'd tests and is ready for op induction. anon@9.18am: India doesn't have an ICBM programme. The government doesn't believe India needs anything beyond an Agni-V. However, DRDO has stated that it has all the "building blocks" in place to put together an ICBM if is called upon to do so in the future. The Surya doesn't exist. sam: range classifications are notoriously fluid. however, the generally accepted norm is that missiles with ranges from 3000-5,500-km are considered IRBMs. Funny that you see a follow-up to Agni V related announcements made earlier this year as an obtuse response to the Chinese interference and "poking their nose into others business" practice? Sadly, we have not yet learnt the art of making statements in seemingly unconnected manner.. Your deduction would have appeared more logical if you had linked this announcement to the deployment of DF 21's in suppressed and tortured Tibet. 2) SLBM capabilities to reach all parts of Heilongjiang from the bay of Bengal. 3) MIRV's and very low CEP. 4) Operational ABM capabilities: We did note the 11 Feb 2007 "proof of concept" intercept of the Chinese FY2 satellite by its SC 19 ASAT system. Also noted was the very subtle co-orbital ASAT demo of 27 Sept 2008, when its Shenzou 7 passed about 45 km from the ISS. The implications are easy to deduce.. Political will is called for, since the scientific & engineering abilities has existed for long. I was thinking same. Though Agni-V is MIRV capable, first few tests will not be with MIRV but single warhead. Shiv, again, you are doing a great job for the country. In my previous comment, Point no. 5 was meant to be the IRNSS (Indian Regional Navigational Satellite System) and NOT the GAGAN. Are they hoping for a WAR in GOOD weather?????
? @shiv sir:we all know that ICBM are equipped with MIRV's which have the capability to 'fool' enemy air defences and have requisite ECM capabilities to jam enemy radar but when looking at density of SAM'' and radars deployed by china(our ma…in rival) which in fact is vey dense and is manily composed of proven and higly effective systems likeS-300 and other SAM which can engage ballistic missiles is there a possibilty that MIRV's can be successfully intercepted.can u comment on this? one more point:all countries are now moving towards developing electro-optical based ABM systems which if properly develpoed can "take out" multiple warheads with ease.so what the future of long range ballistic missiles? ???? ??? ???? ?? ???? ?, ?????? ?? ??? ?? ???????? ?? ??? ???? ?? ??? ????? ! ?? ???? ????? ????? Indian defense planners are like our desi motorcycle manufacturers: we have 125cc, 150cc, 180cc, 200 cc bikes and so on. Why build this useless 5000 km toy? Just develop a single 15000 km missile and then mass produce it; it will give full coverage whether for targets in China or (whisper it) Jesusland. 1. A 15000 km design. 2. A 2500 km design. Creating more and more variants is only going to create logistical hell. Verifying the intergrity and maintaining so many different sub-types over their life cycle is not easy. Above all, it is not necessary. Quit being so afraid of US and "do the needful" already. F***** tired of my fellow desi's cowardice and mental ineptitude. u are yourself mentally ineptitude.the people sitting in drdo and mod are more smart than the people commenting.there is no need to strike a city close the border with a 15000km missle.these missile are more expensive than the 750 km range missilesapply common sense man.there cost runs into millions.even america had no more than 250 icbms at a time.these are not diwali rockets you buy for 2 bucks.hope such dumbos do not become M.O.D mantri.shiv ji plz do not post such dumbo-istic comments. India should develop the ICBMs to dissolve the remnant pockets of resistance at really far off places. Thats a great news…even better wud be when we hear of the MIRVed AGNI launched from Arihant class submarines.. i hope that day/news is not too far off in the future..JAI HIND! ooooh! That must be making the Chinese and Pakistanis quiver in their boots!!! Is China thinking of a limited war? I heard the news that our "great" defense minister Mr. Antony told news "ties with China will continue." What this useless UPA govt is doing? Dont they have balls to show middle finger at China? It is pathetic that a bunch of bas^%* ministers are ruling this country. Can you confirm this? There is something amiss somewhere ! China is playing a big game ! It is because you cannot wish away your neighbors. Sometimes I feel Australia and New Zealand are the luckiest in their geographic location. I envy them. Now paki666 are handing over Indian eternal integral region of Gilgit and Baltistan to the Red Dragon. The signs on sky must be having ominous portents. @ra:it's not surprising to find the chinese presence in the gilgit region. u can always count on pakis to hand their territory for "anti-india" use.what we need is to step up our recon and survelliance capabilities. …and we should strengthen our retaliatory powers against a red dragon designed limited war. Take a leaf from the Sino-Vietnam war. Even a limited radiation strike can also be envisaged against the red dragon, if the need be. Shubham this 3 stage monster wont fit in Arihant – not untill things are miniaturised! @anonymous:u are right.with these small sized arihant class cub's there is the problem of the length of launching tubes fo missiles.there are two ways :either u reduce the length of missiles(which is very complex task and even russian struggled with it) or u make bigger sub's.as u must have heard thta india is moving towards building larger sub's and this method might solve the problem.